Overwhelmed traffic cops in southern China know a police grass when they see one. 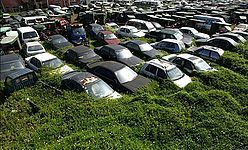 Because these real life crop cars have been put out to pasture in Haikou, Hainan province, as the police can’t afford to take them to the local crusher. "People run up parking and speeding fines and we confiscate their cars. ‘But the fines are so large people just don’t pay them and leave us with the car instead," said a police spokesman. "At the moment they’re all parked in fields with grass growing over them because we can’t even afford to pay for them to be recycled," he added.